WE NEED YOUR HELP WITH OUR HISTORY! As time marches on we are loosing the pictorial history of our parish, especially from 1900 until 1950. 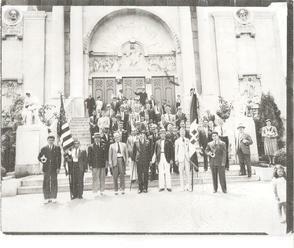 From 1900 until 1950 we need photos of St. Lucy’s Church and Cabrini School. PLEASE! If you have any photos will you share them with us? These may be construction, Baptism, wedding, First Holy Communion, Cabrini graduations, parish societies, Cabrini Sisters, or any pictures relating to our parish and former school. Actually any pictures from any year are wanted. Remember they may not be as valuable to the next generation and may be lost forever. As part of our website and achieves they will live forever as a memorial to your loved ones. Eventually, our parish history will also be made a part of the Lackawanna County Historical Society and will be a prominent part of the early history of Scranton, Pa.
We do not want to keep the originals. If you send us the originals we will scan them into the computer and return them to you. We will pay for the postage both ways. You can also get them scanned to a disk at a drug store, Wal-Mart or Stapes. Then all you have to do is mail the disk to us. We will gladly pay for all charges relating to the disk and mailing. If there is writing on the back of the picture can you have that side scanned as well, especially if it contains the date, place or names. We ask you make the effort to help preserve our parish history as a memorial to all the people that have made it a magnificent place of worship. Your photos can be a memorial to your loved ones. Click here to learn about the priests who have served Saint Lucy's Parish! When Reverend William O’Hara, D.D., came to Scranton in 1868 as its first Bishop, he found the city in its infancy of life. Its city charter was received in April 1866, and Mr. E.S. Hill, lawyer and editor, was elected its first mayor for the term of office of three years. 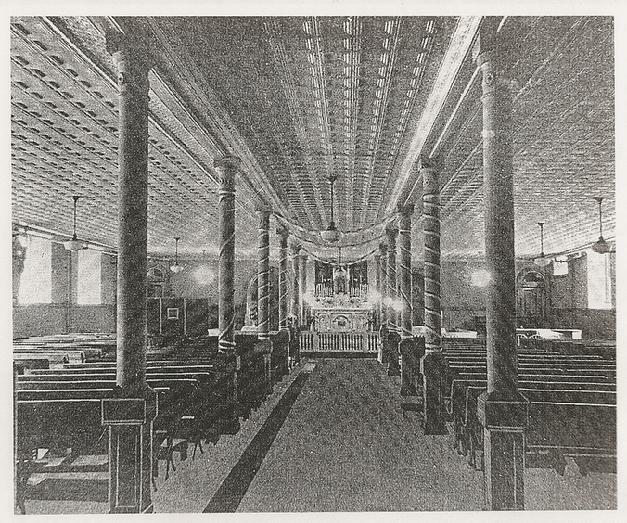 The two catholic churches in Scranton, one Irish and the other German, constituted the only two places of worship where all of the nationalities had to resort for their spiritual comfort. Nationalities represented in the scattered communities were the Polish, Italians, Magyars, Maronities, Slovaks, Slovenians, Melchites, and Tyroleans. The two churches (Cathedral of St. Peter and St. Mary of the Assumption [German]) were manned by three priests who covered their field of activity in a vast area comprising what is now all of Scranton from Green Ridge to Minooka including Dunmore and Taylor. The first attempt to organize a purely Italian parish was in 1874. Bishop O’Hara was undoubtedly aware of his particular mission among the Italians when he received the Papal Rescript of appointment as bishop of the Diocese of Scranton. His experience, as Vicar General of the Philadelphia Archdiocese and as a pastor of Saint Patrick’s of that city, enabled him to understand their problem. The Italians settled around Saint Patrick’s in Philadelphia. Thus coming to Scranton, Bishop O’Hara saw the great need for someone to take care of them, especially since various Protestant sects had begun to send in Italian speaking ministers to proselytize among the Italians. In the summer of 1874, Bishop O’Hara invited several priests from outside the diocese to officiate in the celebration he had in view, namely, to consecrate the Diocese of Scranton to the Sacred Heart of Jesus. To make the celebration an appropriate one, he ordered the first priests’ retreat to be held in May of that year as a prelude to the solemnity. In attendance were 38 priests. Rt. Reverend William Henry Elder, D.D., Bishop of Natchez, Mississippi directed the retreat and later preached at the Mass of Consecration, where Bishop O’Hara pontificated. Presumably, the presence of Father Charles Cicaterri, S.J. in these ceremonies was a response to a call for Italian confession to be heard at the Cathedral. He remained at the Cathedral for a while and later attended a reception at Saint Cecilia’s Convent on August 14, 1874. After these religious ceremonies, he returned to his former duties at the Church of the Gesu and as chaplain at St. Joseph's Hospital in Philadelphia. Rt. Rev. William Henry Elder, D.D. There was a lapse of almost thirteen years before the appearance of another Italian priest in the diocese. Meanwhile, the Italian immigrants were ministered to by the non-Italian priests who learned the Italian language while doing their priestly studies in Rome. Then, in 1888, Bishop O’Hara brought to Scranton an Italian priest named Father Francis Joseph Chiuso who went by the name "Fr. Joseph." Before coming to Scranton, he labored in Jersey City, New Jeresy where he assisted in the founding of Most Holy Rosary Parish, the first Italian church in New Jersey. Then for a short time he was the assistant pastor at St. Rose of Lima (now Sacred Heart) in West Brighton, Staten Island, New York. 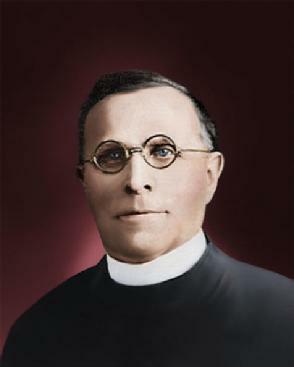 From 1888 to 1891, Father Chiuso resided at St. Peter’s Cathedral Rectory as the fourth assistant pastor with the title, "missionary for Italians." He had the responsibility for the formation of the fledgling Italian Colony of Scranton. After almost four years of dedicated ministry and travel throughout the area, the Italian Colony of Scranton was firmly established. In 1888 St. Thomas College (now the University of Scranton) was built on the present sight of the Cathedral Prayer Garden. The Italian Colony had now outgrown the chapel at St. Cecilia's Convent (on the sight of today's Chancery) and moved to the St. Aloysius Chapel in St. Thomas College. The next area in need of organization was Hopeville (now Weston) near Hazleton. Here many Tyroleans from Northern Italy settled but had no priest of their own. Occasionally a priest would come from nearby Hazleton. Knowing the need for Fr. Chiuso’s great skills, Bishop O’Hara sent Fr. Chiuso to organize the Tyroleans in Hopeville and the Italians in Gowan and Derringer. Eventually, a Tyrolean parish was built. Fr. Chiuso only stayed a few years in the Weston-Hazleton area before returning to Most Holy Rosary Church in Jersey City, New Jersey. During this time many ethnic groups began to come to Scranton. Italians from Naples to Sicily now made up the bulk of the Italian immigrants. Bishop O’Hara appointed Fr. 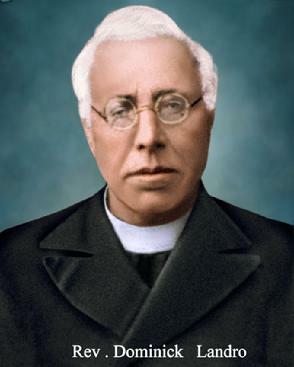 Rosario Nasca as the first pastor of the Italian Colony of Scranton in early 1891. From this point on the Italian Colony kept its own sacramental records. He lived in the Cathedral Rectory and conducted services in St. Aloysius Chapel in Saint Thomas College. Today's Cathedral Convent was built as the faculty house for the the Christian Brother's who ran St. Thomas College. On March 20, 1891 Fr. Nasca recorded his first baptism as the pastor of the Italian Colony of Scranton. The unique honor of having established St. Lucy's parish must go to Fr. Rosario Nasca. The foundation of Saint Lucy’s Parish can be traced back to the year 1891 when Fr. Nasca was appointed by Bishop O’Hara as the first pastor of the “Italian Colony of Scranton.” He was the pastor from 1891 to 1894 (though not consecutively). Under Fr. Nasca the Italian Colony of Scranton grew in size and financial resources and began to consider erecting their own church. Also, with Fr. Nasca, the Italian Colony maintained its own sacramental records. Prior to 1891 the sacramental records are at St. Peter’s Cathedral. After March 1891 the records were kept by the Italian Colony and then by its successor, St. Lucy’s Church. When Fr. Nasca came to the Diocese of Scranton, he first ministered at the Italian Mission (Most Precious Blood) in Hazleton from 1887 until March 1891. Fr. Nasca, building upon the work Fr. Joseph Girimondo (1885-1887), purchased property in 1887 and built the first Most Precious Blood Mission. The present edifice is on the same property and became a canonical parish in 1905. When Fr. Chiuso left the Diocese of Scranton in late 1890, Bishop O’Hara asked Fr. Nasca to become the first pastor of the Italian Colony of Scranton. The first recorded baptism of Fr. Nasca was on March 20, 1891. Within a short time Fr. Nasca became a beloved pastor and garnered the respect of the Scranton community. However, Fr. Nasca’s time in Scranton would be short and he had to return to Hazleton and the Italian Mission in late 1891. Fr. Nasca continued to travel between Hazleton and Scranton all through the years. He was dedicated to both missions. Fr. Nasca’s return to Scranton in early 1894 was short lived again. Fr. Nasca, having spent himself in his priestly duties, became very ill and in late 1894 returned to Italy to recuperate. We are currently doing research on Fr. Peter Bondi and will update his entry at a later date. In 1894 Father Dominick Landro was appointed by Bishop William O’Hara, D.D. to succeed Father Rosario Nasca as the fourth Pastor of the Italian Colony of Scranton. Father Landro performed his first baptism on July 17, 1894. Under Father Landro’s capable leadership, the Italian Colony not only grew in numbers but became prosperous enough to begin planning for their own church in the late 1890’s. Under his leadership the Italian Colony outgrew the St. Aloysius Chapel at St. Thomas College (now the University of Scranton) and in 1900 purchased the old No. 16 public school at 115 Chestnut St. (now St. Frances Cabrini Ave.) in West Scranton. 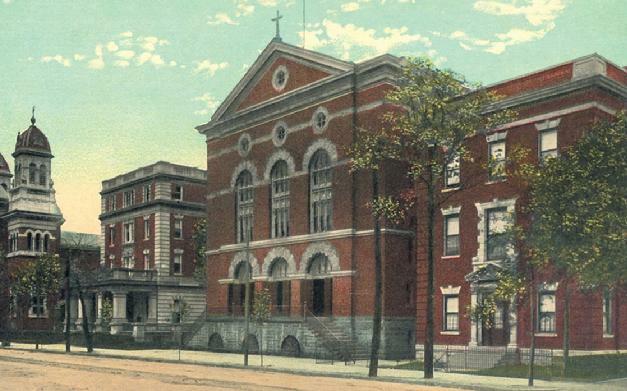 Under Father Landro's untiring leadership the Italian Colony of Scranton became St. Lucy's Church which was dedicated by Bishop O'Reilly on April 1, 1900. 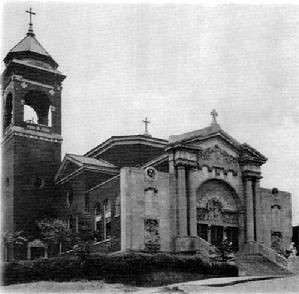 St. Lucy's Church, as the successor of the Italian Colony, thus became the Mother Italian Church of the Diocese of Scranton. At the same time, Father Landro and prominent members of the Italian Colony asked Mother Frances Xavier Cabrini (now St. Frances X. Cabrini) for her help. Between 1899 and 1901 Mother Cabrini made six trips to the Scranton Area to help establish the new parish and to assess the viability of having her sisters, the Missionary Sisters of the Sacred Heart, operate a parish school. The year 1900 was also monumental because on Feb 26, 1900 Cabrini School was organized and on March 20th opened with 75 students. The old No. 16 school would function as the school and church with the top floor as the convent. Years later, the house behind the school would be purchased and become the convent. The rectory was in an adjacent house to the school. Her Missionary Sisters of the Sacred Heart staffed the school until 1971 when it merged with St. Patrick’s School close by. In a day and age when travel was not easy, Father Landro traveled extensively in the Diocese of Scranton and either founded or continued to organize the Italian missions in Scranton, Dunmore, Old Forge, Hazleton Area, Carbondale, and Williamsport. Eventually these became the parishes of St. Lucy, St. Anthony and St. Francis of Assisi in Scranton, St. Mary’s in Old Forge, St. Anthony and St. Rocco in Dunmore, Most Precious Blood and Our Lady of Mt. Carmel in Hazleton, Our Lady of Mt. Carmel in Carbondale, St. Anthony in Freeland, Our Lady of Mt. Carmel in Pittston, St. Mary in Lattimer Mines and St. Nazarius in Pardeesville (near Hazleton), Mater Dolorosa in Williamsport, and others. Father Landro proved to be an energetic missionary to the Italian communities of Northeastern Pennsylvania. Father Landro traveled to Wellsboro, Elkland, Williamsport, and other areas where Italians had settled and either organized them into a mission or helped them integrate into existing parishes. Father Landro was concerned about the life of his people who found it hard in America. In 1898 he began the Italian Catholic Society to provide benefits in case of sickness or death. This was of great comfort when there were no social programs available. In 1901 Bishop Hoban transferred Father Landro to Hazleton as the pastor of Most Precious Blood Mission which he founded. Father Federico Sbrocca then became the fifth pastor of St. Lucy’s Parish. Father Landro continued to travel throughout the diocese when called upon. When Father Sbrocca left St. Lucy’s Parish in 1906, Father Landro returned to St. Lucy’s Parish as its sixth pastor. His second time at St. Lucy's would be difficult. It seems the Trustees of St. Lucy’s had given Father Sbrocca a most difficult time. Having driven Fr. Sbrocca out they were ready to treat Fr. Landro the same it he didn't cooperate with them. On top of this, Italian immigrants from different parts of Italy carried over the old hatreds to America and did not get along peacefully among themselves. Thus, Father Landro’s second time at St. Lucy’s was very different from his first pastorate. During the severe winter of 1908 Fr. Landro became ill with severe chest ailments, probably pneumonia, and returned to the warmer climate of southern Italy to recuperate for several months. It seems the Trustees would not provide adequate funding to heat the rectory. Fr. Raffaele Bellini, the assistant, was appointed the administrator and then pastor when Fr. Landro, upon his return, went to Most Precious Blood, Hazleton where he remained until his death in 1929. The turmoil of the past with the Trustees and various community factions had not yet run its course. The constant tensions took its toll on Fr. Bellini. After six months as pastor he resigned and returned to Italy in early September 1908. Bishop Hoban then looked to the Stigmatines for assistance. 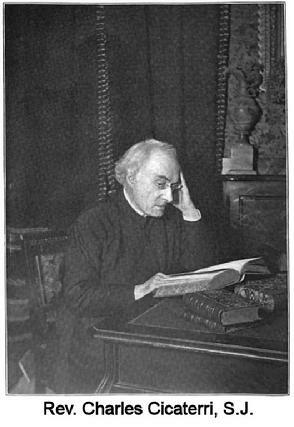 In 1901, at the age of 49, Fr. Sbrocca immigrated to the United States and came to the newly established St. Lucy’s Church. He performed his first baptism on June 30, 1901. Fr. Federico Sbrocca succeeded Fr. Landro to become our fifth pastor from early 1901 to December 1906. Fr. Sbrocca was highly educated and a very accomplished priest. He was a professor, an author of books and articles on the education of deaf mute children, and a well known lecturer. Fr. Sbrocca was a leader of the early movement in Europe for the education of deaf mute children. Indeed, Fr. Sbrocca built one of the first institutes in Italy solely for the education of such children. For his groundbreaking work, Fr. Sbrocca was appointed a Knight [Cavaliere] of the Crown of Italy by King Umberto I in January of 1896. Fr. Sbrocca brought his many talents to St. Lucy’s. Having been newly established it was time to organize the Italian Colony into a canonically erected parish. For this endeavor Fr. Sbrocca was well suited. Under his direction the newly formed parish thrived as it grew in numbers and the school doubled in size. Early on it was evident that a new church edifice would soon be needed. Fr. Sbrocca began the early planning efforts for a new church edifice and was very adept at raising funds for that purpose. Because of his organizational skills and fund raising abilities, St. Lucy’s Parish became more than financially sound. Unfortunately, as Fr. Sbrocca’s work in the parish produced much fruit tensions with the Trustees grew. They began to harass Fr. Sbrocca. One such means was by sometimes not paying his full salary but only making partial payments or by not reimbursing him for expenses. The Trustees even accussed him of stealing $97. The parish became bitterly divided between those who supported Fr. Sbrocca and those who supported the Trustees. In an attempt to calm the situation Bishop Hoban appointed Fr. Gerard Angio as the Administrator of St. Lucy's Parish in June of 1906. However, the situation worsened to the point that Fr. Sbrocca's supporters threatented to cause a split in the parish. At the urging of Fr. Sbrocca, his supporters gave up their petiton drive demanding that Bishop Hoban reinstate Fr. Sbrocca or they would form an independent Italian parish. The situation came to a head in December of 1906 when the Trustees accused Fr. Sbrocca of embezzling the astronominical amount of $38,000. By today’s standards that would be about one million dollars. This time the Trustees went so far as to swear out a complaint at the magistrates office and Fr. Sbrocca was forced to get a lawyer to fight the charges. There was no way St. Lucy's could have had that much money since it was in debt and the creditors were knocking at the bishop's door. This accusation, like the previous one, had no merit other than to harass Fr. Sbrocca. The Trustee system was replete with cronyism and corruption. The Trustees controlled all the material aspects of parish life; i.e. 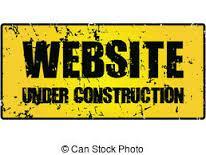 all monies, repairs, hiring, awarding contracts, etc. Even the Black Hand and Mafia were infiltrating the Trustee system of many parishes to avail themselves of church monies. When the priests would fight against such corruption, the Trustees often turned on their pastors. There are many instances of the need for police protection when the priest tried to enter a church or celebrated Mass. Eventually the Church did away with the Trustee system. However, several ethnic groups followed their Trustees and left the Catholic Church rather than remain faithful to the bishop. Since the Trustees controlled all parish monies, the latest accusation against Fr. Sbrocca came to nothing legally. The Trustees withdrew their charges. However, if this latest accusation was intended to finally get rid of Fr. Sbrocca, then unfortunately it worked. In December of 1906 Fr. Sbrocca left the diocese and went to the Diocese of Buffalo where his talents were greatly utilized in the building of Italian parishes and schools. Fr. Sbrocca returned to Italy at the age of 67 in 1919 and peacefully died in Naples in 1925. His hometown of Matrice, Italy erected a plaque and renamed an avenue in his honor. When Fr. Sbrocca departed, Fr. Landro was transferred back to St. Lucy's parish as its sixth pastor in December of 1906. In 1908 he would gladly return to Most Precious Blood Parish in Hazleton. The time frame involving Fr. Bellini is fascinating and almost unbelievable unless one is aware of the fierce political and regional divisions that existed in Italy during the Risorgimento. This decades old movement was one of constant bloodshed and political intrigue. Eventually Italy became a nation but it was born in division, strife, political chaos and unending bloodshed until after World War I. The political rivalry gave rise to the Blackshirts (Fascists), Redshirts (Socialists/Communists), Anarchists and many smaller groups. We know from history that Benito Mussolini, using the Blackshirts, would become the dictator Il Duce. And of course always in the shadows were the criminal element; the Black Hand (extortionists), Mafia and Cosa Nostra (Sicily). It was a time when political power was exercised mostly with bullets and bombs. These bitter political divisions and organized crime were brought to America by some of the immigrants and played a role in the life of Italian parishes. The early priests had to deal with regional hatreds, Blackshirts, Redshirts, Anarchists, the Black Hand, Mafia, and corrupt Trustees. Often various groups would form temporary alliances to achieve their ends. Although the majority of Italians wanted a new life far away from Italy’s strife and chaos, even they had to suffer at the hands of these groups who often gave all Italians a very bad image. Bombings, threats of bombs and assaults against the priests and churches were not uncommon as the priests fought against the Fascists, organized crime and corrupt Trustees. Indeed, it was the Italian priests who were at the forefront of organizing the anti-Black Hand/Mafia movements. For their efforts some had to arm themselves and hire a bodyguard. All these currents of chaos and division were present when Fr. Raffaele Bellini came in 1907 to St. Lucy's parish to assist Fr. Landro. Fr. Bellini came from St. Rocco’s Mission Church in Dunmore. The first recorded sacrament by Fr. Bellini at St. Lucy's was a marriage witnessed on April 29, 1907. Also, at this same time, the last Italian service was held in St. Aloysius chapel of St. Thomas College on July 14, 1907. All Italian services were now conducted at St. Lucy's Church on Chestnut St., (now St. Frances Cabrini Avenue) West Side Scranton. Fr. Landro led efforts in Scranton to organize the movement against the Black Hand and Mafia. He also opposed the Blackshirts and Redshirts who vied for support in the parish. It appears that the opposition to Fr. Landro came also from these outside groups. By this time the turmoil in the parish made it necessary for there to be two policemen on duty at each service to prevent volatile tensions from becoming outright riots. It was hoped that Fr. Bellini, a well loved priest at St. Rocco's Mission, would be more acceptable to the majority of the congregation. When Fr. Landro took a leave of absence in February of 1908, Fr. Bellini became the administrator and then pastor. When Fr. Landro returned, he went to Hazleton. Fr. Bellini was also charged with trying to persuade the Trustees to pay the mortgage on the parish. The Trustees would not pay the mortgage while Fr. Landro was at St. Lucy’s. It was hoped that Fr. Bellini would have better success as the creditors were demanding from Bishop Hoban that they be paid. It is unclear what transpired among all the church factions but there would be no peace at St. Lucy’s Church. Even though Fr. Bellini was very well accepted in the parish he soon became unacceptable to the same forces that opposed Fr. Landro and for the same reasons. Fr. Bellini continued the struggle against corruption in the parish and the Italian community. The turmoil in the parish continued unabated between the supporters and detractors of Fr. Bellini. Because of Fr. Bellini's great charactor and religious commitment, the spiritual life at St. Lucy's continue with great parish celebrations and parades for the Feast of St. Lucy and the Feast of Our Lady of Mt. Carmel and St. Rocco. St. Lucy's to this day still has a rich spiritual heritage because of its early pastors. The tensions among all the factions finally exploded on Sunday, September 6, 1908. While preaching, some members arose from their seats and yelled out that they wanted a new priest. This immediately caused an eruption of emotions and the two policemen who were on duty in the church tried to calm the disturbance before all the yelling came to blows and ended in an all out riot. Fr. Bellini was so afraid and shocked by the spectacle that he collapsed. It is uncertain whether those who arose were Trustees or other factions or a combination of aligned factions. It was assumed that it was the Trustees themselves or staged by them from what transpired the next day. On Monday, September 7th, Bishop Hoban had had enough and summoned the Trustees and leaders of the various groups along with Fr. Bellini. He reaffirmed Fr. Bellini as the pastor, fired the old Committee of Trustees and appointed a new Committee of Trustees. However, the new found peace did not last long. The politics and turmoil would continue at St. Lucy’s. By the middle of September Fr. Bellini had had enough, resigned from St. Lucy’s and left the diocese. He returned to Newark and in 1909 he returned to Sicily. When it was learned that Fr. Vittorio Gurisatti, C.S.F. (a Stigmatine priest) was to become the new pastor there was a movement in the parish by Fr. Bellini’s supporters to form an independent church and hire Fr. Bellini as the pastor. Dispite his ill treatment by a few, the vast majority of parishioners came to love the gentle Fr. Bellini. Fr. Bellini would never support this action nor would he ever return to Scranton. On Friday, September 11, 1908, Bishop Hoban met with the Stigmatine priests and representatives of the various factions of St. Lucy’s parish. By the end of the meeting an amicable settlement was insisted upon by Bishop Hoban and all agreed (though some did not like it) that a new pastor would come to St. Lucy’s Parish. For his installation as the eighth pastor of St. Lucy’s Church, a platoon of 10 policemen was stationed nearby just in case they were needed. To everyone’s great relief their services were not required. A few parishioners did leave St. Lucy’s parish. Others pulled their children out of the parish school. A few joined other non-Catholic denominations. With the arrival of the Stigmatine fathers the process of healing began and peace would eventually come to St. Lucy’s parish. According to the 1908 Official Catholic Directory the situation for Italians missions had improved greatly in the diocese. Many early missions, first ministered to from St. Lucy’s Parish, had become canonical parishes. The great work of Fathers Nasca, Bondi, Landro, Cerruti, and Sbrocco and Gurisatti had come to fruition. In Carbondale, Scranton, Dunmore, Jessup, Pittston, Wyoming, West Wyoming, Wilkes-Barre, Freeland, Latimer, Old Forge and Hazleton the Italian missions had grown sufficiently to become canonical parishes in their own right. Meanwhile, at St. Lucy’s the turmoil between the priests (Fr. Landro and Fr. Bellini) and the Trustees continued. However, a brighter day was about to dawn when the Stigmatine Fathers came to the diocese. The Congregation of the Sacred Stigmata was founded in Verona, Italy in 1816 by St. Gaspar Bertoni. In 1905 Fr. Louis Lucchi and Father Anthony Dalla Porta, of the Congregation of the Sacred Stigmata, arrived in the diocese and were sent by Bishop Hoban to Our Lady of Mt. Carmel Tyrolean Parish in Hazleton. Two years later, on November 1, 1907, Fathers Joseph Nardon (also listed as Nardone), Victor Gurisatti, Alfred Balestrazzi and Brother Camilo Ramus arrived in the Untied States and joined Fr. Lucchi in Hazleton. During the severe winter of 1908 Fr. Landro became ill with severe chest ailments, probably pneumonia, and returned to the warmer climate of southern Italy to recuperate for several months. (It seems the Trustees would not provide adequate funding to heat the rectory.) Fr. Raffaele Bellini, the assistant, was appointed the administrator and then pastor when Fr. Landro, upon his return, went to Most Precious Blood, Hazleton. The constant tensions took its toll on Fr. Bellini. After six months as pastor he resigned and returned to Italy around September 1908. Bishop Hoban then looked to the Stigmatines for assistance. St. Lucy’s was about to enter into a whirlwind of change, hope and growth. Fr. 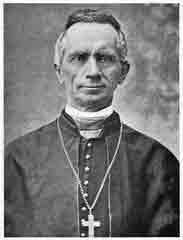 Gurisatti recalled, in a report to his Superior General in Verona that on September 13, 1908 Bishop Hoban met with Fr. Gurisatti and without anyone’s knowledge at St. Lucy’s, took him to Chestnut Street to see the parish. The parish, at the time, included three sections of the City of Scranton: Hyde Park, Providence and the Southside along with Taylor and Moosic. There was one Italian priest at St. Lucy’s for the 2200 Italian families with more immigrants arriving daily. Fr. Gurisatti was not impressed with the material condition of St. Lucy’s Parish. He mentioned, in his report to the Superior General, that “the humble and miserable conditions of St. Lucy’s Parish were evident.” Aware of all the shortcomings and challenges that St. Lucy’s offered, Fr. 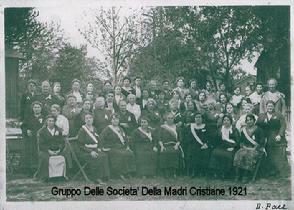 Gurisatti assumed the pastorate of St. Lucy Church on that day, September 13, 1908. The Committee of Trustees did not welcome Fr. Gurisatti. Fr. Gurisatti commented that “the souls were in a quandary when three times he had to go to Bishop Hoban because he was not allowed into the church to say Mass.” With the support of prominent parishioners, Fr. Gurisatti was finally able to celebrate Mass for the parish. As with earlier pastors there were threats against Fr. Gurisatti’s life if he didn’t quit the parish. The threats may have come from the Anarchists, Black Hand, Mafia, Socialists, Fascists or others. Most probable they were from the Trustees. It was not an easy time in the Italian community as they struggled to distance themselves from these groups. The Italian priests were foremost in organizing the Italian communities against these groups especially the Black Hand who then were the principle gangsters that used extortion and kidnapping to terrorize the Italian Community. On several occasions the Italian priests met with Bishop Hoban and local authorities about this issue. Fr. Gurisatti also informed his Superior General about the condition of the two properties on Chestnut Street (now Cabrini Ave.) controlled by the Trustees. The church, school and convent were in one building at 115 Chestnut St. and the rectory was at 206 Chestnut St. He mentioned that the rectory was in good condition and that it was recently built. However, it was scantly furnished and did not have adequate heat. The second building that served as the school, church and convent was an old school building purchased in 1899. (This was the original #16 Public School. The second #16 PS was also built on Chestnut St.) Fr. Gurisatti would have to beg the Trustees for repairs since it was in deplorable condition. However, Fr. Gurisatti did not despair but took on the challenges. He began winning over the parishioners by his kind demeanor and genuine interest in his priestly duties. Beyond the Trustees and physical condition of the parish, Fr. Gurisatti found a people deep in faith and desirous to support the spiritual and physical needs of the parish. Fr. Gurisatti was a born leader, especially in hardships. With the assistance of Fr. Angelo Simeoni, St. Lucy’s would grow in faith and fellowship. Many sodalities and societies came into existence over the years. These included the Christian Mothers, Blessed Virgin Mary Sodality, Junior Blessed Virgin Mary Sodality, Rosary Society, Altar Society, Sacred Heart League, Holy Name Society, Italian Men’s Club, Knights of the Altar (altar servers), Sacred Heart Society, sport teams, and others. The school had the Mother Cabrini Society (PTA). The Sisters and students were very active in the spiritual life of the parish especially in school plays and parish rituals and processions. Gradually the turmoil at St. Lucy’s subsided due to the great work of Fr. Gurisatti and the assistants who helped him. New Trustees were elected in 1911 that were eager to work with Fr. Gurisatti. The congregation readily accepted the leadership of their priests. The congregation was becoming “American” and saw a great hope for the future. Within rapid succession the Trustees, working with Fr. Gurisatti, paid off the old debts and plans were begun in 1911 for a new parish church. St. Lucy’s had outgrown the auditorium of the school. The transformation of the Italian population in West Side Scranton was due to the great leadership of Fr. Gurisatti who had a kind heart, great energy and keen leadership. Fr. Gurisatti, like former pastors, was a leader in organizing the Italian community to fight against organized crime and political corruption. The Black Hand, Mafia, Anarchists, Socialists, Fascists and others increasingly became ostracized by the Italian community. As the Italian community grew in education, size and affluence, such groups were no longer acceptable or tolerated. Newspaper articles of the period are filled with dynamite bombings against prominent people and even St. Lucy’s as these groups tried to hold on to their power. They would remain a nuisance in the Italian community until after World War II when most were deported, especially the Fascists of Mussolini. PICTURE: Dr. E.A. Heerman's House as it appeared January 1899. 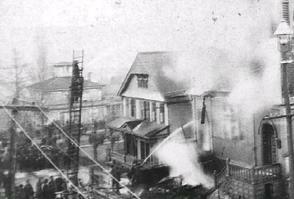 The picture (Times-Tribune Newspaper) is of the First Baptist Church, Scranton St., when it burnt down. Today, May's Appartments occupies the lot. The furture rectory of St. Lucy's Parish is in the lower left. The Cabrini School helped the Italian community became well educated. This was one of the great successes of Fr. Gurisatti who worked to build up the school and support the Cabrini Sisters. Through the school, a generation of Italians moved from the status of immigrant to middle class. America was a place of new beginnings and hopes for a better future. The Italian community was becoming shop owners, doctors, lawyers, professionals, and tradesmen with their own businesses. St Lucy’s grew to become a powerhouse of spirituality and influence in the City of Scranton. Truly a new day had dawned for St. Lucy’s Parish. So much so, that plans were underway for a new parish church. PICTURE: St. Lucy's Italian American Club. Italian council, Chevalier (Knight) of the Crown of Italy Fortunato Tiscar, a prominent member of St. Lucy's Parish is in the front row center (late 1920's). Ground was broken on Wednesday, September 24, 1913 for the basement church (now the church hall) and the cornerstone was blessed by Bishop Hoban on November 27th. There was a huge procession of societies, sodalities, children, sisters and parishioners from the school to the basement church. Many of the Italian clergy and local parish clergy joined with Bishop Hoban to complete the procession. The stone was inscribed; “In honor of St. Lucy, V.M., A. D. MCMXIII.” [In honor of St. Lucy, Virgin and Martyr, in the Year of our Lord 1913] Mr. Frank Carlucci was the general contractor and Vincent Russoniello was the architect. The basement church was finished in time for Christmas and served for all religious functions until 1928, when the magnificent upper Church was completed. In 1914 St. Lucy’s comprised over 1000 families. In a report to the Superior General, the Committee of Trustees noted about Fr. Gurisatti, “He is very popular with the parishioners and he is an indefatigable worker. By his exemplary zeal he did much to maintain and fortify the religious spirit of his people.” In 1914 Fr. Gurisatti was included in the prominent book A History of Scranton and Its People by Col. Frederick Hitchcock. World War I would intervene and delay the construction of the upper church. 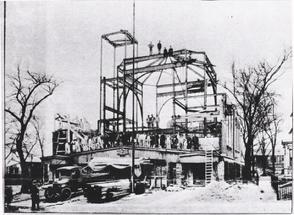 St. Lucy’s was the first church in the West Side to have a steel structure. However, due to World War I all steel was diverted to the war effort. Thus it would not be until 1928 that the upper church would be dedicated. The corner stone notes the dates as 1913-1928. In February of 1916 Fr. Gurisatti signed his Petition for Naturalization and in June become a citizen of the United States of America. By June 1924, with the war over, the steel structure for St. Lucy’s Church was erected and the brick and masonry walls were begun. The magnificent Carrara marble façade began to arrive from Italy as well as the beautiful Carrara marble appointments for the interior. St. Lucy’s was being described as the largest undertaking of its kind in beauty and expense anywhere among the Italians. By the time the church was dedicated the actual cost was $250,000 or almost $7,000,000 today. There were also magnificent devotional ceremonies at St. Lucy's. In 1926, a triple celebration of the Assumption of Mary, The Sacred Heart of Jesus and Feast of St. Rocco was held on the weekend of the August 15th. The celebration began with a social on the church grounds on Saturday. On Sunday, a procession of several hundred was held around the neighborhood ending with outdoor Benediction of the Blessed Sacrament with many area priests assisting. A grand social with bands and dancing was held that Sunday afternoon into the late evening. This was also the day when prominent churchmen from Italy came to speak. On July 16, 1926 Monsignor Joseph Bellino, an accomplished speaker and writer in Europe, spoke at St. Lucy’s on the Feast of Our Lady of Mt. Carmel. There were so many people that several Masses had to be schedule that morning. Msgr. Bellino, who preached at all the services, celebrated the first morning Mass at 8:00 A.M. and Fr. Gurisatti the second at 8:45 A.M. and so on. Following the well attended Masses a procession with the statue of Our Lady commenced with several local Italian bands, many Italian clergy from the diocese, local clergy and hundreds of people through the local neighborhoods. That night Msgr. Bellino spoke again and celebrated Benediction. After Benediction the festivities with food and music continued on the Church grounds and at 10:30 P.M. a beautiful display of fireworks were enjoyed. By the 1920’s St. Lucy’s Parish was a much different parish than on September 13, 1908 when Fr. Gurisatti first saw the parish and commented on its humble and miserable condition. But the great work of Fr. Gurisatti would take its toll on his health, both physically and mentally. His health began to fail due to the constant pressure of work he put upon himself, especially building and funding the upper church. The pressure led to nervous exhaustion which began to effect his mental attitude. He was starting to become disenchanted and disheartened. He began to believe that he was alone with no support from his superior in Hazleton, his Congregation and the Bishop of Scranton. There was also a matter of a poor investment made with the Congregation's money and the demand of the Superior General for an accounting. There might have also been the desire to move Fr. Gurisatti to another assignment or back to Rome for the accounting. Fr. Gurisatti’s response to the whole situation was a request to leave the Congregation on June 15, 1921 and become a priest of the Diocese of Scranton if the bishop agreed. In his current state of mind he was not about to leave his beloved St. Lucy’s where he had labored so long and hard and had made many friends. During the next few years Fr. Gurisatti held off the audit of his personal finances by the Congregation. It was only a matter of time before disciplinary actions would be taken by his Superior General. The Congregation for Religious was notified about the situation and that the Congregation may request Fr. Gurisatti's explusion from the Congregation. Fr. Gurisatti received letters from the Apostolic Delegate in Washington D.C. emploring him to fulfill his vow of obedience before sanctions were brought againt him. If the Stigmatines expelled Fr. Gurisatti the Bishop of Scranton would have no choice but to remove him as pastor os St. Lucy's. This might have finally been too much for Fr. Gurisatti. He began to suffer from even greater nervous exhaustion and mood changes. He sometimes became sullen, argumentative and despondent. His physical health grew worse. He began to believe that his local superior, the Congregation and the bishop were against him. Such was not true. Fr. Lucchi, the Superior General, the Apostolic Delegate and the Bishop spent years trying to reconcile Fr. Gurisatti with his Congregation. Tragically the day of reckoning with his Congregation came. Since he had refused the Congregation’s lawful orders, the Congregation requested permission from the Vatican to suspend Fr. Gurisatti from his priestly duties and if need be expel him. Thus on September 5, 1924 the bishop of Scranton had no choice but to remove Fr. Gurisatti as the pastor of St. Lucy’s and remove his faculties as a priest in the diocese. He could no longer function as a priest until some resolution could be reached over his disobedience to his Superior General. The bishop allowed him to remain in the rectory but Fr. Nardon was now the Administrator of the parish. The Congregation did not wish Fr. Gurisatti ill and continued to persuade him to obey. Fr. Peter Piemonte was sent to help Fr. Nardon with the parish and Fr. Gurisatti. As so often happens, there comes a point of no return. Fr. Gurisatti became worse and had a total nervous breakdown. It would take several years of rest and therapy at Mount Hope Retreat Hospital in Baltimore, MD, but everything seemed to have righted itself. Fr. Gurisatti made amends with the Stigmatines and the audit was completed. What irregularities were found were made right. Fr. Gurisatti officially left the Stigmatines in 1927 and continued his recuperation. In August of 1928 he was accepted by Bishop O’Reilly into the diocese. 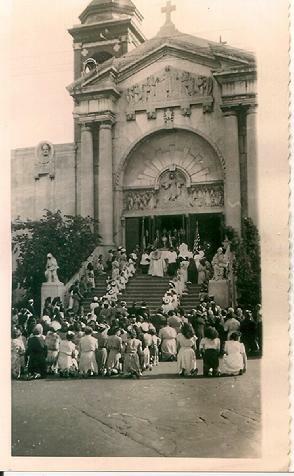 When the Stigmatines left St. Lucy’s Church in 1926 and Fr. James Boland became the Administrator. Fr. Gurisatti was slated, according to the list of moves in the Scranton Republican on September 7, 1928, to be the pastor of St. Rocco’s in Pittston, PA. Unfortunately, Fr. Gurisatti never arrived in Pittston. His health once again deteriorated. On December 28, 1928 there was a relapse and Fr. Gurisatti was hospitalized in Wilkes-Barre PA. He returned to Mount Hope Retreat Hospital, Baltimore, MD where he stayed until his death. We do not know what lead to the relapse. Perhaps the main impetus of his recovery in the first place was the desire to return to St. Lucy’s as pastor and see the church he poured himself into finally dedicated. It was not to be. In December of 1928 the magnificent edifice Fr. Gurisatti built would be dedicated with Fr. James Boland as Administrator of St. Lucy’s. 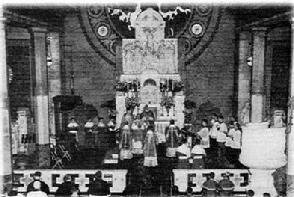 On May 29, 1931, at 10:00 A.M. in St. Lucy’s Church, a Solemn High Requiem Mass for Fr. Gurisatti was celebrated amidst much grief. The bishop was the main celebrant with dozens of priests and many hundred of people from far and wide attending. The Rev. Louis Lucchi, his former superior and close friend, preached the sermon. Fr. Gurisatti was solemnly laid to rest in the Priests Lot in the Cathedral Cemetery. It was one of the largest burials for a priest in the history of the cemetery. It is hoped that Fr. Gurisatti, before his death, realized that he was never alone. Although St. Lucy’s parish continued to function as usual from September 1924 through Nov 1927, it was an uneasy time for the congregation. In 1924 Fr. Gurisatti, who had lead and guided the parish so well, began to suffer from fatigue and depression. He also began to have canonical issues with the Stigmatine Congregation when he refused to be transferred to another parish. All of this culminated with his resignation as pastor in November 1927. Fr. Gurisatti eventually suffered a complete nervous breakdown and was hospitalized. Fr. 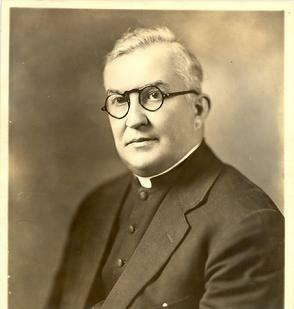 Nardon, the assistant for many years, became the Administrator of the parish in September 1924 when Fr. Gurisatti began to have his canonical troubles. Fr. Nardon was also loved and respected and so parish life continued under his direction with little disruption. A second blow would hit the parish in late 1927 when the Superior of the Stigmatines decided they could no longer staff St. Lucy’s Parish. Fr. Nardon was to be reassigned when the diocese appointed a new pastor for the parish. Now without the familiar and steady hands of Fr. Gurisatti and Fr. Nardon the parish was troubled. The Diocese of Scranton was awaiting the appointment of a new bishop. 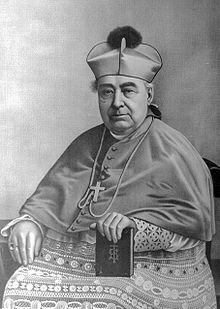 Bishop Michael J. Hoban had died on November 13, 1926. Thus it fell on the Very Rev. James S. Fagan, Administrator of the Diocese, to find a suitable pastor who could take over the parish. The parish needed someone who could give it clear guidance, had firm resolve and also possessed a gentle character… a true leader. Msgr. Fagan’s choice was a well known priest of the diocese, Fr. James Aloysius Boland, who was known to be very competent, a good leader, dedicated priest and had a gentle disposition. In November 1927 Fr. Boland arrived at St. Lucy’s Rectory. Fr. Boland came from a well known family in Archbald, PA. Two of his brothers were Msgr. Patrick Boland and Dr. Frank Boland. Within a short time the fears and unrest in the parish abated. Fr. Boland, who was now 40 years old, was no stranger to Italian parishes having been previously stationed as an assistant pastor at St. Gabriel’s parish in Hazleton, PA. At St. Gabriel’s, Fr. Boland became known for his gentle but aggressive promotional spirit and effective work with the parish, school and societies. It was this spirit that ensured the continued spiritual and material life of St. Lucy’s Parish. Fr. Boland’s leadership quickly gained the support of the parish. There was a sense of being without direction when the Stigmatines left. Part of this fear was the fact that the years of planning by Fr. Gurisatti and Fr. Nardon were coming to fruition. It was an eventful time for the parish. The new Cabrini School was near completion and so was the upper church. Truly, December 1927 proved to be a monumental month for Fr. Boland and St. Lucy’s Parish. On December 6, 1927 Fr. Boland dedicated the new Cabrini School. That was followed by an even larger celebration on December 18th, when the present St. Lucy’s Church was dedicated. It would rest on Fr. Boland to finish the construction of St. Lucy’s Church and oversee the cost which was over $250,000 in 1927. In today’s dollars that is roughly $3,410,056.00. Part of the church’s dedication was a parish drive to raise $25,000 to help pay the debt. This drive was overwhelmingly supported by the parish and concluded successfully by the time of the dedication. Fr. Boland, as he had done in other parishes, saw the need for parish societies. Recognizing the need for a men’s society in the parish, Fr. Boland began to organize the Holy Name Society in early1928. The Holy Name Society had its first Communion breakfast on July 10, 1928 at the Hotel Casey with 150 members in attendance. Vincent Russoniello, the architect of St. Lucy’s Church, was the toastmaster. Mayor John F. Durkin addressed the Society along with Bishop Thomas C. O’Rielly, who just a few days before (July 5th) confirmed over 500 children in St. Lucy’s Church on his first official visit to the parish. Bishop O’Rielly was appointed the Bishop of Scranton on December 19, 1927. The devotional life of the parish was encouraged and strengthened by Fr. Boland. On July 18, 1928 the parish and the Mt. Carmel Society celebrated one of the parish’s major yearly celebrations, Our Lady of Mt. Carmel. The event was marked with Mass and a neighborhood wide procession lead by Fr. Boland and his assistant Fr. William Gislon. As Father Boland had done in his other assignments, he devoted much of his time to the children and he was dearly loved in return. He always had time for them, whatever the occasion. If a child met Father on the street, he or she was sure to end up with an ice cream cone. This act of kindness brought as much pleasure to Father as it did the happy child. His gentle manner and constant concern for his flock marked his priesthood all his life. The parish was comforted by his priestly dedication and leadership. When it came time for Fr. Boland to move to his next assignment in August 1928 as pastor of Immaculate Conception Parish in Taylor, the Holy Name Society planned his farewell reception and at the same time welcomed Fr. 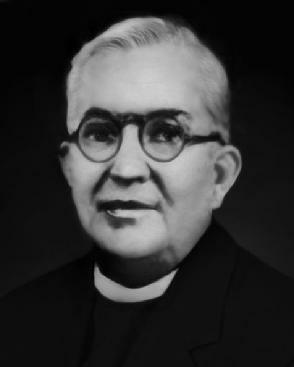 Francis Valverde, the former pastor of St. Anthony’s, Dunmore. Over a period of ten years the people of Taylor were shepherded by this gentle and loving priest. Fr. Boland died in the rectory of cardiac arrest on March 25, 1938. Bishop William J. Hafey, with many priests of the diocese, celebrated his funeral Mass on Monday, March 28, 1938 at Immaculate Conception, Taylor. Fr. Boland is buried in St. Thomas Cemetery, Archbald. We will hopfully have the next section completed soon. The assistants under Monsignor Florey included Reverend Peter Monleon, Reverend Monsignor Joseph A. Madden, Reverend Paschal Trozzolillo, Reverend Donald Deuel, Reverend Myron F. Florey, Reverend Hugh Lenahan, Reverend Joseph Ferrese, Reverend Salvatore P. Oliviero, and Reverend Anthony Tombasco. 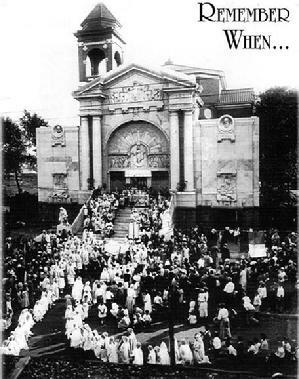 The Golden Jubilee of the parish was fittingly observed on Sunday October 14, 1951, with a solemn Pontifical Mass offered by the Most Reverend William J. Hafey, D.D., Bishop of Scranton at the time. Assisting the Bishop were priests of the Diocese who were stationed at Saint Lucy’s with Monsignor Florey. The sermon for the occasion was preached by the Reverend Monsignor Francis J. Furey, rector of Saint Charles Seminary, Overbrook, Philadelphia. The cooperation, loyalty, and generosity of the parishioners of Saint Lucy’s, made possible a program of extensive repairs and improvement. A Golden Jubilee campaign resulted in the final payment of a debt that only a few years before was well over $100, 000. The second half-century of Saint Lucy�s Parish began with everything in order and things running smoothly, thanks to pastor, Monsignor Florey. The church�s membership was growing with the onset of the �Baby Boomer� generation, keeping the three priests busy. The priests also served the sisters and students of Saint Francis Xavier Cabrini grade school. In the early part of 1956, the <?xml:namespace prefix = st1 ns = "urn:schemas-microsoft-com:office:smarttags" />West Side section of Scranton, known at the time as Hyde Park, began to experience what was called �caving� or �settling� problems. This was the result of the deterioration of timbers below the ground after the numerous coal companies in operation in the late 1800s and early 1900s removed coal. Unfortunately, Saint Lucy�s Church was one of the thousands of properties affected. The Diocesan engineers decided to reduce the weight of the structure by the removal of the belfry, which was located on the left side of the church. 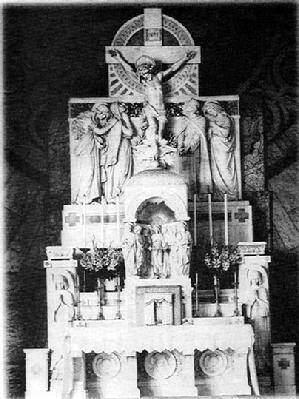 A beautiful marble pulpit, which stood ten feet high, along with marble from the altar and floor, were also removed. A steel beam was installed above the altar to reinforce the church. The church was considered unsafe, which meant the congregation was forced to attend mass in the �Little Arts Theater,� located in the 100 block of North Main Avenue and in the chapel in the basement of Saint Patrick�s Church, Jackson Street. A remodeling project soon began and within a year, Saint Lucy�s Church was back to smooth sailing once again. 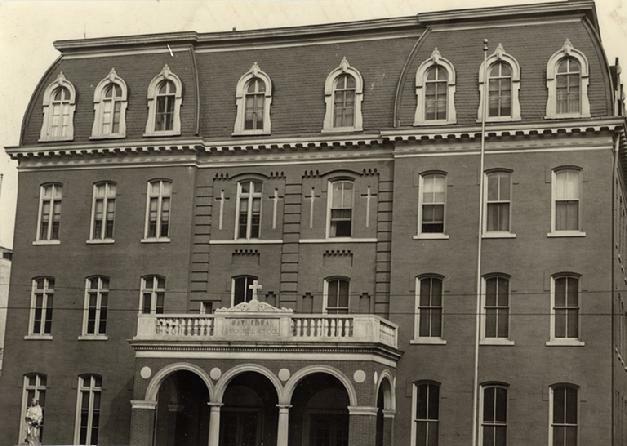 Mother Cabrini School, originally called Saint Lucy�s School, was becoming more popular and experienced a large increase in its enrollment. Also, church activities and fundraisers were offered by the Altar and Rosary Society, Church Choir, Holy Name Society, and Boy Scout and Cub Scout Troops. The parish also sponsored Altar boy trips and garden parties. During the remaining years of the sixties and early seventies, Saint Lucy�s Church continues its tradition as one of the finest churches in the Diocese of Scranton. January of 1973, brought the news that Monsignor Salvatore J. Florey, age 67, was retiring. Monsignor Florey served as pastor for thirty-five years. In September of 1973, he was named pastor emeritus by the Most Reverend J. Carrol McCormick, D.D., Bishop of Scranton. He remained active, occasionally offering mass and performing baptisms and weddings. Monsignor Florey died on October 7, 1984, at the age of 78. His priestly example, dedication, and sacrifices will always be remembered. In the month of July 1973, the parishioners of Saint Lucy�s Parish welcomed Reverend Paul P. Cottone as their new pastor. The first project of the new pastor was the refurbishing of the auditorium and the installation of a new kitchen area. Father Cottone celebrated the twenty-fifth year anniversary of his ordination in 1975. In 1977, a group of parishioners joined together to form the first spaghetti supper committee. The supper was a huge success and currently serves as one of the major fundraisers for the parish. In the 1980s, due to the reforms of the Catholic Church from the Second Vatican Council, the main altar of the church was relocated to enable the priest to face the congregation during mass. The churches carpeting was also replaced, the interior painted, and several murals restored. The grounds were enhanced with the construction of a grotto honoring the Blessed Virgin Mary. Statues of Saint Peter and Saint Francis of Assisi were donated by church members honoring the deceased of their families. A statue of the Sacred Heart of Jesus was placed in the front of the church. The size of the parking lot was increased with the acquisition of surrounding land. New front doors were added along with the reframing and repairing of the stained glass windows. A new organization called the �Parents� Club� was formed. It currently conducts fundraisers throughout the year and was responsible for the annual Summer Festival until the summer of 2004. The last decade of the twentieth century noted the return of the original church bell. The bell was refinished and placed on brick piers near the water fountain in the grotto. The front steps were repaired and new sidewalks added. The exterior of the church and rectory were painted. New boilers were also installed in both buildings. On July 12, 1998, a shrine honoring saint Francis Xavier Cabrini was dedicated. Following the dedication a reception was held in the church auditorium. On June 6, 2000, Father Cottone celebrated the Golden Anniversary of his ordination. He was the principal celebrant of the Mass of Thanksgiving; Reverend Albert Liberatore was the homilist. On September 30, 2001, the parish celebrated its one hundredth anniversary as a faith community in the Diocese of Scranton. Most Reverend James C. Timlin, D.D., Bishop of Scranton, celebrated a Mass of Thanksgiving and a reception was held at Saint Mary�s Center, Scranton. The first one hundred years of Saint Lucy’s Parish were years of growth, development, and the realization of the dream of its early Italian immigrant founders. As the parish began the next one hundred years, Father Cottone announced that he would retire in July 2002 after having faithfully served Saint Lucy’s as pastor for twenty nine years. In July 2002, Bishop James C. Timlin appointed Reverend John J. Chmil as the fifth pastor of Saint Lucy’s Parish in its over one hundred year history. During Father Chmil’s pastorate, the parish experienced a great revitalization in its liturgy and worship. After only three years as pastor, Father Chmil was succeeded by Reverend Anthony J. Generose as Administrator of Saint Lucy’s in June 2005. Father Generose remained there until the appointment of Reverend Samuel J. Ferretti as Pastor of Saint Lucy’s Church on September 1, 2005. Due to the declining number of priests in the Diocese of Scranton and all throughout the United States, Father Ferretti was also named Pastor of Saints Peter and Paul Church on West Locust Street. Under Father Ferretti’s leadership and guidance, the parishioners of Saint Lucy’s are looking forward to the continuance of spiritual enlightenment, devotion, and family values. Fr. Ferretti also jokingly began a “Job Jar”. Work on the church that needed to be done. So far on the outside of the Church the wall behind The upper 1/3 of the façade was repaired and the façade was replaced and sealed. The leaks in the Church dome and broken tiles have been repaired. The flat parts of the roof have also been repaired and our prized Zettler Church windows (recory side) have been totally restored. Inside the Church the main Chandlier was dissembled, cleaned and restored. A new upgraded electrical service for the Church was installed. All statues were repaired and painted. The unknown statue was St. Agnello, one of the patron Sts.of Naples ( it came over from Italy with the founders of the Parish). After upgrading the dome in the Choir Loft we observed a scene that turns out to be Judas Iscariot at the foot of the Cross. You can see 30 pieces of silver falling out of his hands. Judas himself thoroughly distraught, having realized what he did. Our new handicapped ramp was completed along with new lighting around the Church and Rectory for safety and security reasons. And of course, the candle room got a makeover. As the "Job Jar" continues to be filled new projects already need to be done.